In Search of Darkness is a love letter to 1980s horror movies in the form of a documentary. The teaser for the doc begins with some vintage footage of TV journalist Barbara Walters asking, "mutilation, decapitation, torture, does that sound entertaining?" Of course it does! The 1980s was a weird time, but thankfully we had some of the best horror movies ever made come out during that decade. The works of "Cronenberg, Yuzna, Carpenter, Barker," and a lot more are all explored in the upcoming documentary. After the Barbara Walters news footage, the In Search of Darkness teaser turns into a giant collage of everything 80s. 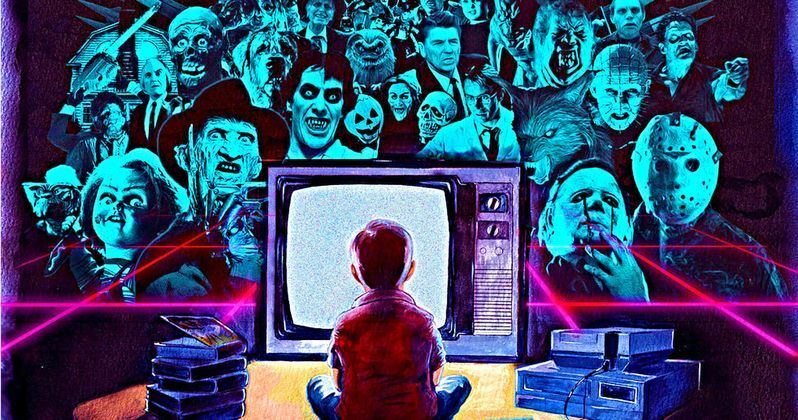 Freddy from A Nightmare on Elm Street shows up right next to a Nintendo Entertainment System commercial and then Michael Jackson's Thriller. Clips from Halloween II, The Stuff, C.H.U.D., The Fly, Child's Play, Creepshow, and Evil Dead II are just a fraction of the clips that get thrown at us in a little over a minute. Though it's just a collection of clips at the moment, In Search of Darkness drives home just how many horror classics were released in such a short amount of time. In Search of Darkness takes the 1980s horror genre and looks at it through a cultural lens. Most of the films from that era were a direct reaction to the times. The theme of greed is common in the majority of the movies, taking a mirror and turning it towards society. Lifestyles of the Rich and Famous along with Donald Trump became the benchmarks for success in American culture at the time and horror movies "gave us the chance to see the horror within society and within ourselves." In Search of Darkness is about to launch a Kickstarter campaign to reach as many horror fans as possible. Not only that, but they want to cover a lot of material, from the posters and VHS covers that made you pick out the film in the first place, interviews with the directors and writers that delivered the material, and then the context in which the 1980s horror genre took place. The official overview for the documentary reads. "Hysteria over AIDS transplanted body horror from the hospital onto our screens, while "Gordon Gecko" levels of excess and fears over rising violent crime met their match in increasingly over-the-top Slasher flicks. But this was a genre with more to offer than cheap scares, from Steven Miner's comedy horror of House to the daunting practical effects of Wes Craven's Serpent and the Rainbow one of the defining characteristics of 1980's horror cinema was its sheer range and imagination when it came to examining our mortality. For the first time, technology became the tool through which these ghouls could invade our homes, staring out at us from eye-popping covered tapes, ready to scare us again and again at the touch of a button." In Search of Darkness has already assembled a huge team to tackle the project, but in order to get it done correctly, they're going to need to expand. The documentary is going all the way back to when horror movies were traded and duplicated amongst friends and collectors, who would often share their stash of Fangoria magazines that they had to hide from their parents. In Search of Darkness is also taking fans back to a time when the video store was the place to hang out with like-minded individuals to get turned on to new epic horror films. The crew has a massive task ahead of themselves, but they seem to have the determination and love to pull it all off. You can head over to CreatorVc and join the mailing list to find out how to help and check out the teaser trailer as well.